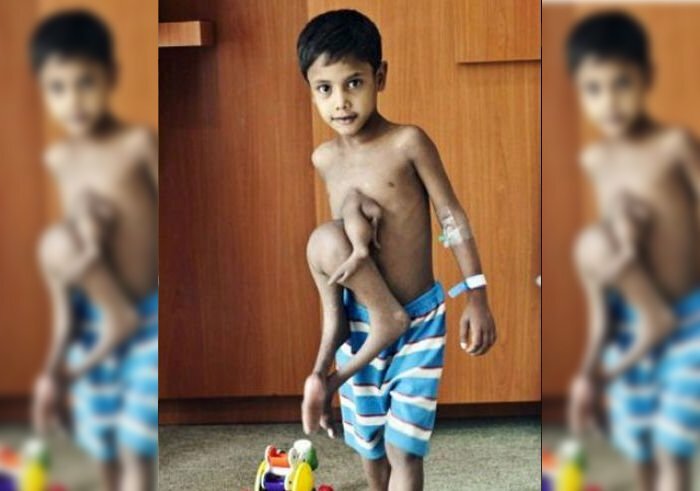 Boy With Eight Arms and Legs Undergoes Surgery to Remove Extra Limbs - 2NGAW! According to Fox News, 7-year-old Deepak Kumar Paswaan has been called many names. Some people have called him “devil” or “freak” while others have visited their home worshipping him as a god. You see Deepak actually has 4 extra arms and legs due to his underdeveloped twin. The additional limbs can be seen growing out of his chest. He has often been a target of bullying but, as mentioned above, some Hindu pilgrims pay their respects to him because they see the boy as an incarnation of Vishnu, a god with more than four limbs. Deepak always enjoyed playing cricket but always had to struggle because of his unique physical condition. Last year, however, the family decided that they want to seek professional medical help for his problem. The parents wanted the boy to live a normal life. “We always wanted surgery to remove the parasitic twin to get rid of him being treated as a religious object by people,” Viresh Paswan, Deepak’s father, commented. The poor family knew the operation would be very expensive and discovered that it will cost them about £50,000. Fortunately, surgeons from the Fortis Hospital in Bangalore expressed willingness to perform the surgery for free. A group of 15 doctors volunteered for the project. Eventually, the breakthrough operation was performed and lasted 4 hours. The surgery succeeded and Deepak couldn’t be happier with the result. ‘I can run faster than my two elder brothers – before I could never keep up. I really like my new body. It’s much more fun. I am very happy,’ said Deepak. Right now, Deepak is enjoying a good life. He will finally be able to play out in the open without being worried about whether or not others will play with him. Share this bizarre story with your social media friends now!